The Brooklyn map represents not only the conception of the Gunner's Daughter brand, but also the underlying maritime inspiration of the Gunner's Daughter brand. Brooklyn was the home of Gunner's Daughter for several years. It is a city that has one of the richest maritime and economic histories of any American city waterway. Much of the inspiration for the brand including the bag details you see on each scarf, like the hooks and shackles, are inspired by the industrial ports in Brooklyn, NY, specifically the area known as Red Hook. The Gunner's Daughter Wallabout Bags are handmade in the Brooklyn Navy Yards, which can be found on the map. The map of Brooklyn has small details like the primary color scheme, directly taken from colors found on hooks and machinery in Red Hook neighborhood. Can you find the the hidden image of the Brooklyn Bridge in the border of the scarf? Small details like these are what make the Brooklyn map a beautiful keepsake for anyone who has been captured by Brooklyn's past and present. The Golden Isles map was created not only because it is the home of Gunner's Daughter designer and founder, but because its dreamy beaches and unforgettable scenery are a sight for sore eyes. Nestled on the South East Georgia coast, midway between Savannah, GA, and Jacksonville, FL, lies the mainland city of Brunswick and its four beautiful barrier islands: St. Simons Island, Sea Island, Little St. Simons Island and Jekyll Island. Pristine stretches of marshland, punctuated by small islands known as hammocks, define the breathtaking landscape and create the appearance of a continuous stretch of land reaching out to the barrier islands. The Golden Isles of Georgia are dear to many hearts, which is why this map came into existence. Known as the "Hostess City of the South" Savannah, Georgia is by far one of the most recognizable historic cities in America as well as in Georgia. The Savannah Map is the forever home of the Gunner's Daughter brand. The colors of the map come from the pink and red brick tones one sees the historic bricked streets as well as on the gorgeous townhouses lining almost all the streets. The pale greens are an ode to the gorgeous hues of gardenias and magnolias that are in bloom 4-6 months out of the year in Savannah. The color of the Savannah map are different than the other more "coastal" maps and that is because it was intended to be a Fall collection, although you will find, it can be worn and displayed year round. In addition to Savannah, Georgia being the "Hostess City of the South", It is also recognized as one of the most Haunted cities in the USA. Savannah's rich historic past lends itself to keeping the city and homes filled with spirits, tales, and folklore. The Midnight Garden Edition of the Savannah Map is meant to be a "nighttime" version of the original Gunner's Daughter Savannah map. The colors are deep plums and shades of teal paying an Ode to the city and how beautiful, whilst eery, it can still be when the sun is down. The Bermuda Map is a unique map because it was commissioned by a friend of the company, for his future wife. He requested the map be made and highlight the parishes that make up Bermuda's unique layout. Each Parish is different and has it's own flare. Several other places on the map are acknowledged because they are significant to the love story of the couple. Bermuda is the first Non-USA map that Gunner's Daughter has made. The Bermuda map is exclusively sold in Bermuda at Luxury Gifts Bermuda, inside of the Hamilton Princess. The Hispaniola map was created for the World Water Relief fund. The Map depicts Haiti and the Dominican Republic surrounded by a vast blue ocean. Images of locals carrying water jars on their head is meant to give one a glimpse into the importance of water in countries where clean water has been extremely scarce. The Hispaniola collection is a limited edition collection that can be produced upon special request. For each product purchased with this map on it, Gunner’s Daughter will donate 10% of profits to the World Water Relief organization for which the map was made. The Gunner's Daughter Jersey map features the island of Jersey. Jersey's unique history has been moulded over time by Ice Age visitors, occupying forces, languages and local traditions. You can experience major historical sites dating back hundreds of years, which are now open to the visiting public. From World War II bunkers to ancient burial grounds, farm houses, castles and caves. The Channel Islands were the only part of the British Isles to fall into enemy hands, when they were occupied by German forces between 1940 and 1945. Many of the coastal military zones and inland sites are still visible to this day. Thanks to the hard work of local historians and associations many are open to the pubic, allowing visitors a glimpse at what life would have been like during that period. The surrender of Germany was announced on the 8th May 1945 with the official arrival of allied forces on May 9th, our Liberation Day. The Jersey Map was made as a gift from Gunner’s Daughter to her sister in law and brother in law for their wedding. The map served as the seating chart for the tables where each table was named after the beaches of Jersey. 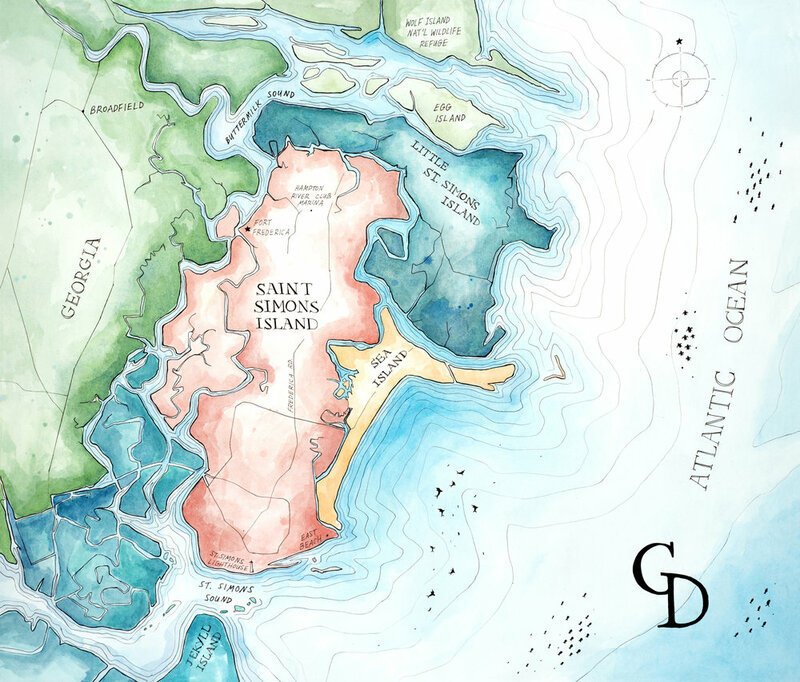 The Gunner's Daughter St. Maarten map features the Caribbean islands of St. Maarten, Anguilla, & St. Barthelemy. This map features quite a few recognizable landmarks and locations due to the nature of how it came to be. Another one of our commissions, this map was also requested as a gift for parents who live on St. Maartens. You can also spot some local flora and fauna on the map.